Hello again – surprise – it hasn’t been that long since my last post!!! This little beauty is a recipe I developed for Fairfax a few weeks back, and it will be appearing in newspapers around the country today, including the Dom in Welly (go buy a copy Pog)! Anyhoo, as you can see from the picture, this is a lamb salad using fab backstrap fillets (I bought Silver Fern Farms ones, as they seem to be totally foolproof, you just need to cook them properly! 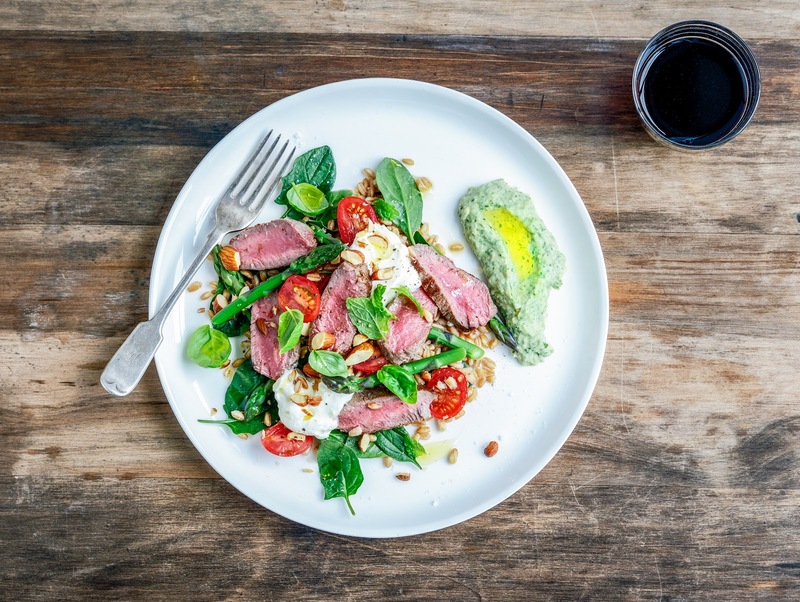 ), layered up with fresh baby spinach, new season’s asparagus, ripe, sweet cherry tomatoes and all of this is interspersed with nubbly, nutty farro (an Italian hulled wheat), mint, basil and crunchy roasted almonds and garlicky homemade labneh. On the side is a luscious big smear of herby cannellini bean hummus. This recipe was (literally, haha, by me) made for spring, and a total doddle to make! Line a sieve with muslin. Stir garlic and lemon zest through yoghurt, season with salt and pepper and pour into muslin. Leave to drain for at least 90 minutes before starting on the rest of the salad – the longer you leave it the firmer it will be. Mix 2 tablespoons olive oil with cumin, salt and pepper and brush over lamb. Heat a frying pan or barbecue hot plate and cook fillets on a medium high heat for 3-4 minutes on each side (depending on thickness). Remove from the pan and cover with tinfoil to rest. Bring a medium pot of salted water to boil, add farro and cook 15 minutes. Drain well and stir through 1 tablespoon oil, salt and lemon, leave to cool for 5 minutes. While farro is cooking bring another pot of water to the boil and drop in asparagus spears for 2 minutes, drain and refresh under cold running water. Toss warm farro with spinach, asparagus and tomatoes. 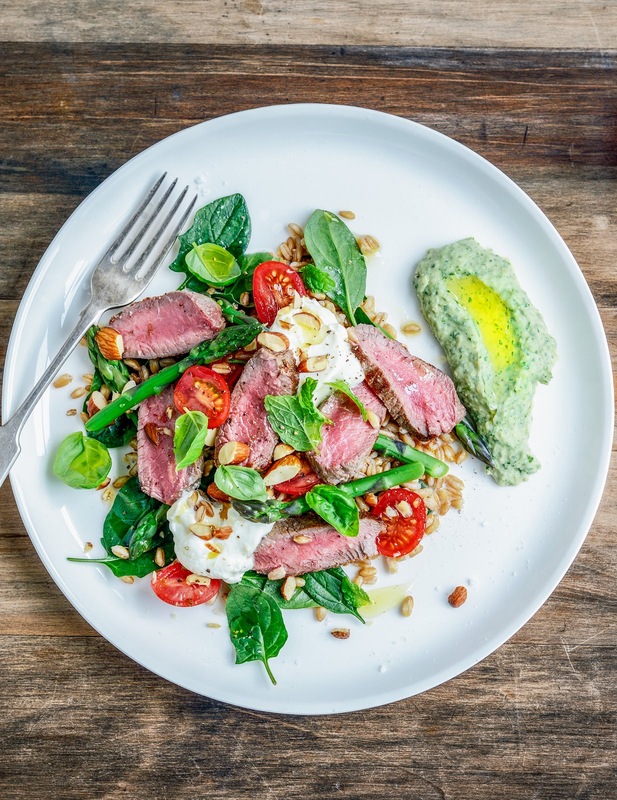 Serve with scoops of soft labneh (yoghurt ‘cheese’), fresh herbs or crumbled feta, chopped almonds, a drizzle of remaining olive oil and sliced lamb fillets. This is great with a big dollop of herby cannellini bean hummus on the side. Put all ingredients in a food processor and whiz to combine. Season well to taste with sea salt and freshly ground black pepper. Makes 2 cups This is beautiful spread on toast or bruschetta with ripe tomatoes, in salad sandwiches, with crackers or as an accompaniment to mediterranean meat dishes.